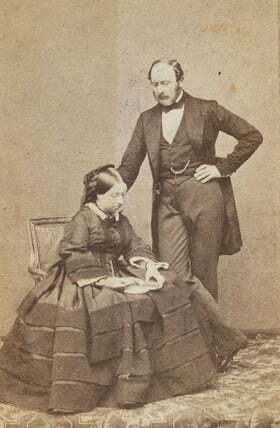 Photo of Prince Albert and Queen Victoria. Throughout history, men used ornamental items to proclaim their status and display power and superiority. In many periods, men were generally much more bedazzled than their female counterparts. 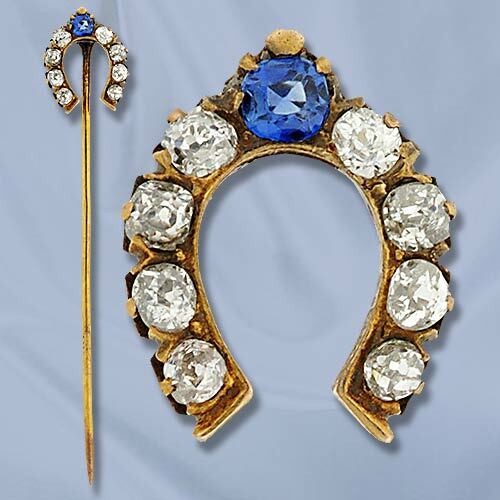 As the Victorian period started, the eighteenth-century fashion of the Macaroni and the Incroyable had passed and men were wearing far fewer jewels than their ancestors. The well-dressed Victorian male followed a strict dress code which included only “essential” jewelry items. An abundance of opportunities for gentleman to wear jewelry presented themselves but they were expected to keep it understated and not outshine the women. Jewelry with a raison d’être such as holding a shirt together, keeping a tie in place and telling the time were all that was necessary. Those who continued to flaunt fashion excess, wearing numerous glittering jewels, buckles, rings and the like, were known as “fops.’’ Masculine jewelry was evolving from flashy adornment to practical and useful understated items and men were now expected to adopt this more restrained attitude. What we refer to today as “stickpins” were called cravat, scarf or breast pins and were quite popular throughout the Victorian period. These were comprised of a rod-like pin, up to three inches in length, worn vertically, with a decorative element perched at one end. These pins were designed to help secure a scarf, ascot, cravat or what have you. Other forms of jewelry created to secure neckties were also available. Cuff links, shirt studs, waistcoat buttons, and rings were acceptable. 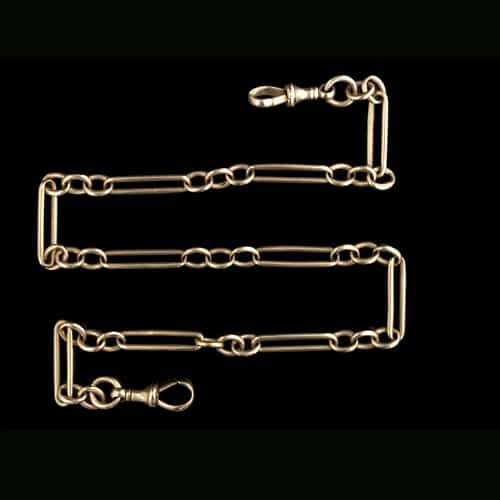 Watch chains, now refined and understated with a single fob or seal, a neckchain which could be used to suspend eyeglasses and a gold-headed cane were also within the norm. A gentleman’s watch chain was one of the last areas of personal expression allowed by society. A decorative watch key, an ornamental locket with hair mementos and a fob, or two, were deemed appropriate accoutrements. The Prince of Wales, Albert, wore elaborate match and pencil cases on his watch chain. Tokens of friendship and sentimental mementos were as popular with men as they were with women. Locks of hair secreted away in hidden lockets were suspended from many a watch chain. Poet Robert Browning’s watch chain sported a telescopic pencil, a ring that had been treasured by his beloved wife and a twenty-lira coin that signified a cause his wife supported. Victorian Watch Chain in Yellow Gold. Vintage Enamel, Yellow Gold Horse Racing Cuff Links. 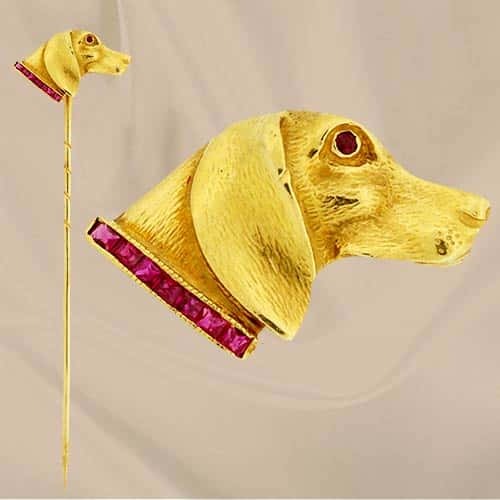 Victorian Gold and Ruby Dog Stickpin. 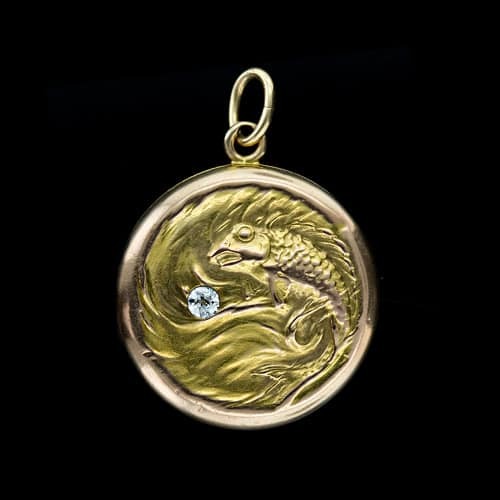 Victorian Fish Motif Gold Locket. Jewelry representative of a sport or gaming pursuit was popular with both sexes. 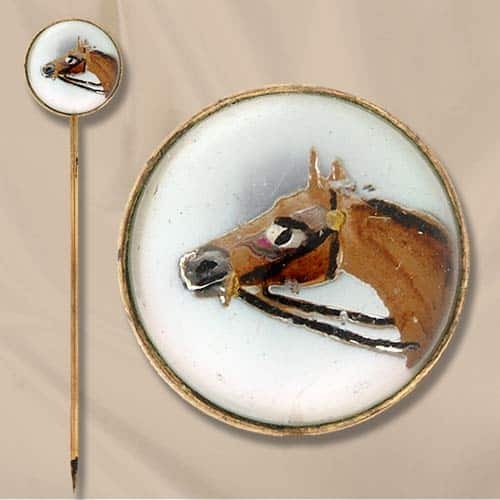 Men showed particular interest in horse racing and hunting jewelry. Jewels for the hunter included stick pins, cuff links and charms with foxes, rabbits, hounds, boars and stags often rendered in full color with enamel or reverse painted crystal intaglios. Sometimes souvenirs from the hunt, such as stag’s teeth or grouse feet, were converted into jewelry so that the “trophy” could be proudly displayed. The French, in particular, loved all things equestrian. Equestrian jewelry, bijoux hippiques, fashioned as whips, bits, nails, spurs, horseshoes, and stirrups were worn by both men and women. Watch chains for men abounded with horse themes, including the curb chain itself – named for the chain from a horse’s bridle-bit. 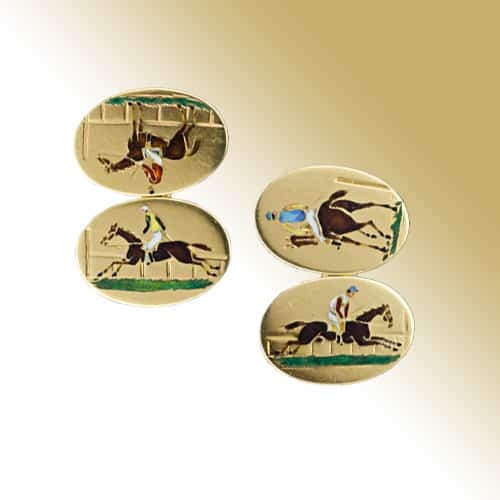 Badges were produced by the various horse racing clubs in excess of those produced for any other sport. Men displayed their interest in other sports through jewelry as well: there were brooches with crossed oars and boats to proclaim affiliation as a rower; fishing rods and baskets, feathered lures and fish also found their way into jewelry motifs; croquet jewels, tennis racquets, roller skating and bicycling mementos were all sported by both sexes with equal fervor. Ice skating, tabogganing, curling and snow shoeing were North American pursuits and jewelry commemorative of such sporting events was confined almost exclusively to that continent. Echos of these themes continue into the twenty-first century and the well-dressed male can still be seen wearing necessary jewelry.